This was the bloodiest round of the tournament – just two draws in seven games! Five games ended in White’s favor. As you can see, the right to make the first move plays a vital role at this level. In the Ragozin Defense Levon created non-trivial problems for the opponent with his novelty 11.Qb4! I think Pavel’s reaction wasn’t optimal. Instead of 11…Ne4 much stronger is 11…a5!, for instance, 12.Qd4 b6!, and Black can castle and develop the bishop to a6. The Black’s knight arrived to e4, but it only provoked the raid of its White counterpart. White placed his knight to d6 and got strong pressure on Black’s weak pawns. 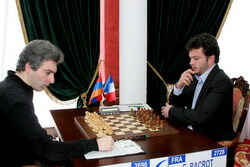 Eljanov initiated exchanges, after which Aronian’s bishops began to dominate. Black’s 29…Nfe4+ was played out of desperation. 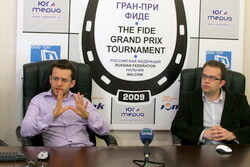 Aronian confidently converted the decisive advantage. A good game. In the Rubinstein System of the Nimzo-Indian Defense Black got a very solid position, but did not equalize completely. White gained more space, and his bishops were potentially very strong. The position was quite complicated, as neither side could easily develop the initiative. Grischuk played very slowly, and provoked the opponent to employ a risky plan. The h-pawn home run (22…h5 and 22…h4) did not bring Black any fruits. White’s strong reply 24.e5! cut Black’s pieces off the kingside. Grischuk developed very strong initiative. It is difficult to point at the decisive error. I can only recommend 25…Ndf4 26.Ne4 c4!? with the idea to sacrifice an exchange on d6, and if 27.Rdc1, then Black can sacrifice a pawn by 27…Nd3. In both cases he gets some initiative on the light squares. After the knight was transferred to f5 (25…Nde7), White got an extra pawn without any compensation. Evgeny gave up another one in order to proceed to the ending with opposite colored bishops, but it didn’t help. Alexander overcame his usual time troubles and showed good technique during the concluding stage. The line of the Petroff that occurred in the well-known 15th game of the Karpov-Kasparov championship match in Moscow 1985, was recently reassessed in White’s favor. Even the fire-proof Kramnik lost two games (to Naiditsch and Ivanchuk)! Lately Black found some saving ideas, but today another blow came! Leko showed that White does not have to regain the b5-pawn. By 17.Be3! he completed the development and soon started to create serious threats. I enjoyed the tricky 20.Qc2! with the idea to sacrifice the queen on h7 after the knight check from e7. The march of the f-pawn to f7 (21.f4!) was also splendid. It became clear that Peter follows his home analysis, when he instantly played 25.Kf1! not allowing the Black’s queen to f2, and solving the back rank problem. Of course, sooner or later Peter had to start working at the board, but it did not prevent him from following the first suggested line of the best computer engines until the very end of the game. White’s final attack (started with 27.f6! ), its pointe – 34.Qg7+!, and, last, but not least, the sharp-minded knight maneuver 43.Na8! make it a real masterpiece. Congratulations, Peter, bravo! This game contained a number of finesses, and Black’s first and only mistake became fatal. 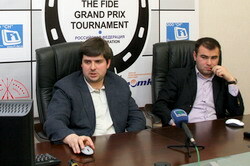 The players discussed the Shabalov-Shirov Variation of the Slav Defense. The position quickly became original. Black had problems with his king, however, Peter bravely started to fight in the center (16…c5!) and for a long time played very well, but apparently spent too much energy and got very tired. On the 31st move he could force a draw by 31…Rd7! (and White must give the perpetual), but blundered. After 31…Ke7? 32.Rxf2! it turned out that Black cannot take the rook on f2 due to tactical nuances. Shakhriyar was merciful in his final attack. The 36.Bxg7! blow immediately killed all the resistance. White did not get anything out of the Accelerated Dragon. Black managed to carry out some exchanges and created counterplay on the queenside. His novelty 12…Ne5 proved decent. However, it seems Bacrot overestimated his chances. By 22…Rb4 he could force a draw (23.Nc3 Rd4! etc. ), but decided to continue the struggle, and ended up in an unpleasant ending. White’s pawn majority on the queenside was the most important positional factor. Perhaps detailed analysis will show many ways for Black to make a draw, but finding any of them at the board was difficult. Akopian demonstrated impeccable technique (41.g4!, 49.b4!) and won a good game. In this game Karjakin tested Ivanchuk’s knowledge of Karjakin’s games. Up to the 37th move the players repeated Karjakin-So, UAE 2008. The tempo of the game was very slow, creating the illusion of serious struggle. Ivanchuk played a new move – 37…Re8, but the position was completely drawn anyway. I don’t think this game will add anything to the theory manuals of the Sveshnikov Sicilian. The 4.Nc4 Variation of the Petroff was considered harmless for Black, and this game did nothing to alter the evaluation. White was busy fixing the disadvantages of his structure, and allowed simplifying exchanges in the center, after which Black had no problems whatsoever. 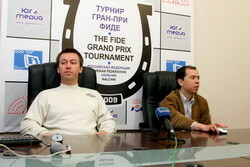 The grandmasters played well, did not blunder anything, and kept changing pieces. There is only one moment that requires clarification. When Kamsky sacrificed the d4-pawn, Kasimdzhanov could show some greed by 29…Rf8!, which would extend the struggle. However, in the game he allowed the opponent to annihilate everything on the queenside, and it ended in a dull draw.